Paul Catchpole leaving Elgin Sheriff Court. 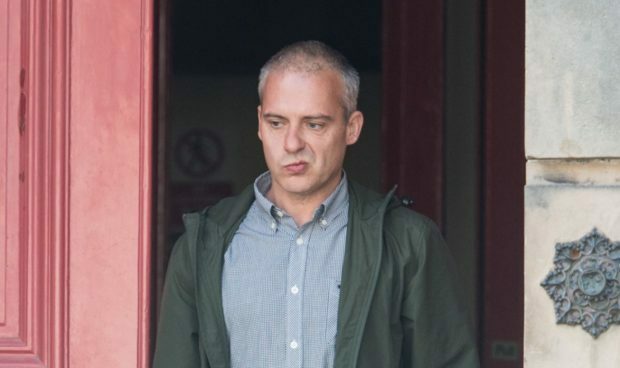 Paul Catchpole, from Elgin, smashed glass on the floor, punched the walls and pulled equipment out of its socket. When his partner Beata Iwaniuk tried to call the police, the 47-year-old pulled the house phone from the wall and threw it in a pot containing boiling pasta before throwing the contents over the kitchen floor. During the incident, Catchpole also trashed the couple’s daughter’s playroom by throwing her playhouse across the room as well as a table, chairs and her computer. Yesterday the dad narrowly avoided a prison sentence when he appeared at Elgin Sheriff Court. Fiscal Alex Swain described the ordeal as “distressing” for the occupants of the Kingsmills home. Sheriff Gary Aitken told Catchpole that only his early acceptance of guilt had ensured he would not be sent behind bars. Defence solicitor Matthew O’Neill explained his client was “unsure” about whether the relationship could be rebuilt. Miss Swain said Catchpole, who is unemployed, left the family home at about noon on July 18 to collect his daughter’s birthday present and returned home at about 5.30pm having been drinking. Miss Iwaniuk, who earns the household income, then became “visibly upset” after realising he had spent her wages on alcohol. At this point, Catchpole began shouting and swearing at his partner of eight years while accusing her of being unfaithful. Miss Iwaniuk was eventually able to contact the police. When officers attended they found the home in “disarray”. While in custody, Catchpole repeatedly told police that he did not care what had happened. Mr O’Neill added: “He’s thoroughly ashamed. On this day he had been consuming a significant amount of alcohol. Catchpole, of Guildry House in Elgin, was sentenced to 100 hours of unpaid work and was placed under supervision for a year after admitting a charge of behaving in a threatening or abusive manner likely to cause his partner fear or alarm.